This roof took a beating! 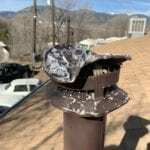 Check out this roof vent that looks like someone hit it with a baseball bat. This is the result of at least one severe hail storm. We found this doing a roof inspection recently. When we see damage like this we know something is also likely wrong with the roofing system too. New Roof Plus is certified by Haag as Residential and Commercial Roof Inspectors. This roofing certification lets building owners and managers know they are working with a highly qualified roofing professional. The roofing certification from Haag is expensive, time consuming and difficult to achieve. New Roof Plus – Colorado Proud and Certified! Very few Denver roofing companies go the extra length to get this certification. It is not required by the State of Colorado. It costs money. It takes a lot of time to complete. You need a higher level of intelligence to pass. It’s not easy. So most contractors avoid it. We don’t avoid it. We want to be the best and to have the most knowledge. This will help us do a better job for each of our customers. If you would like a roof inspection fro New Roof Plus, call us. It’s free and completed by a true roofing professional Certified by Haag.